My Cowboy is participating in Movember and has grown a fine handlebar mustache and matching sideboards/burns, having started with a clean shaven face on the 1st of November. I have to say it's not my favorite look for him but hey all for a good cause. The cause being the raising of funds and awareness for men's health issues, specifically prostate cancer and depression. I am in full support of Movember,not only because it is a worthy cause, but because of the personal connections I have, my Step-Father had prostate cancer and I have been suffered from depression in the past. 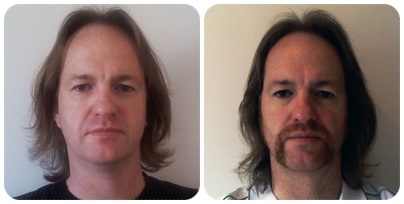 You can read more about Movember here and if you wish to donate you can do so by clicking here.